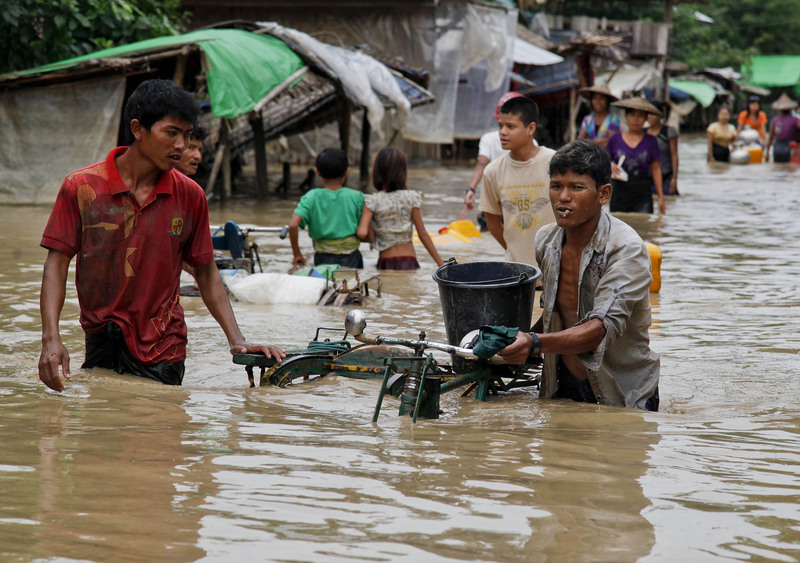 After days of severe rains across swathes of Myanmar in the wake of Cyclone Komen, Doctors Without Borders / Médecins Sans Frontières (MSF) is working with local government authorities to provide medical and non-medical aid to thousands of people affected by flooding. Rakhine State, where MSF already runs several medical programmes, is one of the most critically impacted areas. The most heavily affected townships are Minbya, Mrauk U, Kyauktaw and Buthidaung. Over 4,000 displaced people in Minbya are sheltering across 23 monasteries. Though immediate medical needs appear low, there is widespread damage to homes and infrastructure, and drinking water has been contaminated. MSF, together with community leaders and authorities, has sent drinking water, blankets, mosquito nets and soap by boat to distribute to those displaced. In Sittwe, Rakhine’s state capital, joint Ministry of Health and MSF teams provided health care in a monastery where many people displaced by flooding were gathered for shelter. In Maungdaw township, northern Rakhine, MSF is assessing people’s needs while providing medical care to those affected through its regular mobile clinics and additional ones in affected areas. There is clear need for shelter, and MSF is working to get plastic sheeting into the town. Meanwhile, MSF staff based in nearby Buthidaung township report massive destruction. However, road access is currently impossible due to landslides. The team is investigating access option from Sittwe via the river. MSF has offered its assistance in other areas of the country if required to the Ministry of Health, including outside areas it currently has projects. MSF has worked in Myanmar since 1992 and currently has medical projects in Rakhine, Shan and Kachin states, the Thanintharyi region, and in Yangon. MSF offers services including basic healthcare, reproductive care, emergency referrals, and malaria treatment. Since 2004, MSF has treated more than 1.2 million people across Rakhine State for malaria. MSF is also the largest provider of HIV/AIDS care in Myanmar, currently treating over 35,000 HIV patients nationwide, as well as 3,000 people for tuberculosis. MSF is also experienced in disaster response, and provided assistance to 460,000 people follow Cyclone Nargis in 2008.